I had some of the kindergarten moms over to our house this morning to plan the class Halloween party. 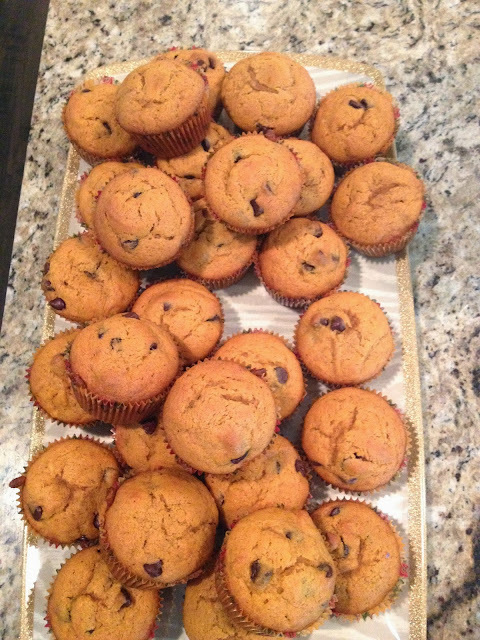 I decided to make some hot apple cider and pumpkin chocolate chip muffins to set out. I had been wanting to make and freeze some muffins anyway, and the apple cider can be made in about 2 minutes. Instead of mixing together multiple spices and cloves and everything else, my mom told me to just mix apple cider, cranberry juice, and a few cinnamon sticks, and throw in the crockpot. It was so easy and so good! I only used about half of the apple cider and a quarter of the cranberry juice. You want to have at least two parts apple cider to one part cranberry juice. I added two cinnamon sticks for more flavor. This is such an easy way to have a hot drink for guests and it makes your house smell so good! I blogged about these pumpkin chocolate chip muffins last year. A definite must-make item for fall. This recipe makes a lot, and they are easy to freeze, so go get to baking! YUM! I love apple cider. I will have to try this one out for sure! I think the cranberry would add a delicious little "zing!". Def try it! So easy and just adds a little "oomph" to everyday cider! Thanks for stopping by!